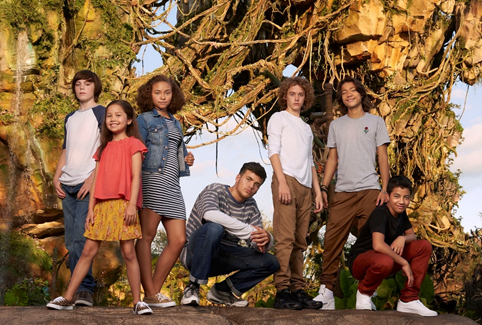 20th Century Fox has revealed the newest cast members of the AVATAR SEQUELS who recently explored Pandora – The World of Avatar at Disney’s Animal Kingdom for inspiration. Concurrent production began in Manhattan Beach, CA on Monday, September 25th on the four sequels, the first of which will be released December 18, 2020. Jamie Flatters - Neteyam (neh-tay’-ahm) Jake and Neytiri’s first born son. Britain Dalton -Lo’ak (loh’ ahk) Lo’ak is Jake and Neytiri’s second born. Trinity Bliss - Tuktirey: (took-tee’-ray) She goes mostly by “Tuk” (rhymes with “nuke”) She is youngest of the Sully family. Bailey Bass - Tsireya (see-ray’-ah) “Reya” She is a graceful and strong free-diver – the young Neytiri of the ocean. Filip Gelio - Aonung (aw-nung’) Young male hunter/free-diver son the Olo’eyktan of Metkayina Clan. Duane Evans Jr. - Rotxo (row’-txoh) Young male hunter/free-diver of the Metkayina. Jack Champion - Javier “Spider” Socorro – A human teenager, born at Hell’s Gate but prefers his time in the Pandoran rainforest more than the asphalt of Hell’s Gate.